1. Place the fruit, crème de cassis and sugar into a large saucepan and cook on a medium heat for 5 minutes. Set aside to cool. Stir through the mint then drain in a sieve, reserving the juice. 2. Soak the bread in the reserved juice and place a third in the base of an 18cm-square dish. Top with half the fruit and mint mixture and spread evenly to the edge of the bread, then repeat the layers, finishing with a layer of bread. 3. Cover with cling film, press down and place a plate with a weight on top. Chill for 3-4 hours, or ideally overnight. 4. Cut into 6 slices and serve with clotted cream and any leftover juice. 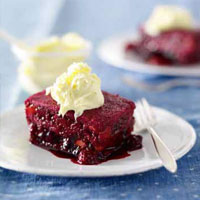 Make use of the abundance of berries by trying other combinations such as raspberries, blueberries and blackcurrants. There’s a new sparkling red in our range that works wonderfully with summer pudding flavours (and also chocolate!). Lively, fruity and a stunning colour, give this a go! Brown Brothers Cienna Rosso 2010 Victoria, Australia.